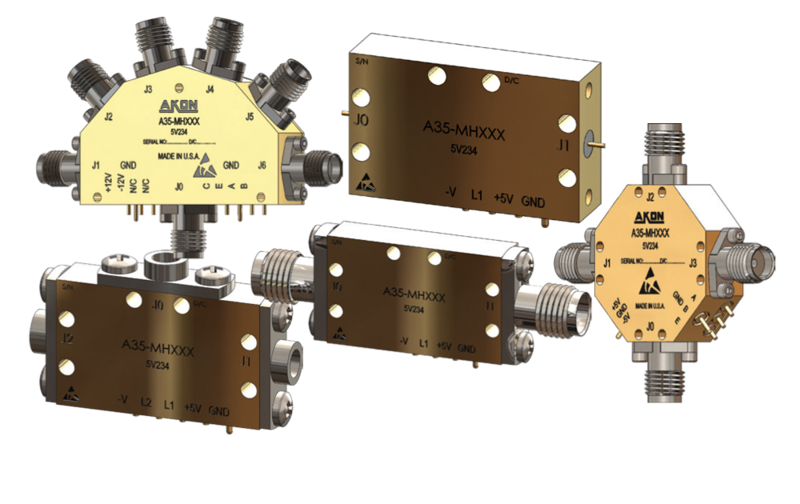 AKON’s product line of RF & Microwave Switches that operates over a frequency range of 0.5 - 40 GHz. These switches are available in standard configurations such as SPST through SP6T with single ended TTL control. Our SP2T switches have a typical Insertion Loss of 1.2 - 1.8 dB, Isolation of 65 dB, and switching speeds of 40 nsec. Package options include Drop-In, SMA/2.9mm & SMP, and offers reflective/absorptive configurations. AKON products are designed to withstand harsh environments of Military, Space and Industrial applications. Our compact and ruggedized products are designed to handle harsh mechanical shock/vibrations, temperature cycling, altitude and temperature extremes. Reliability is a key feature of AKON products and to ensure this we perform ESS testing on all of our products. AKON offers an off-the-shelf screening option called its “H“ series, per Mil-STD-883 level B that is available on all of its RF & Microwave Components. For custom electrical, mechanical, and screening options, please contact AKON Sales: sales@akoninc.com (or) 408-432-8039. Note: You can select different models and submit inquiry or custom quote request with help of different options available at bottom of page.